Milton Friedman titled his 1975 book as, “There’s No Such Thing as a Free Lunch”, to describe Economics. However, many school districts in the United States have taken this concept and applied it literally- by serving children whose lunch accounts fall delinquent an “alternative” lunch, which varies by district. What the “alternative” lunch could consist of, as well as the protocol for serving the lunch, has put a bad taste in many people’s mouths. My interest was sparked on this topic when I read a story about a mother in Charles County, Maryland. She alleged that her children were humiliated by having to return their prepared trays of food to the cafeteria staff; only to get served a cheese sandwich instead, because their lunch accounts had fallen behind more than $12. Although 154 of these “alternative” lunches are served daily in that particular school district; their policy is more lenient than another Maryland school district that begins to serve cheese sandwiches when the lunch account balance reaches $0. The part of this mother’s particular story that is difficult to digest; is that the lunches that were fixed by her children initially were thrown into the trash. School districts maintain that this policy demands accountability, while still providing students with lunch. This policy was implemented so that the district can charge the parent at a reduced rate, and as a result, the deficit amount in their lunch account increases at a slower rate. The outcry in the media about this policy could simply be from parents whom are blaming the school for their own shortcomings, especially since schools do send notification of low lunch balances. Also, the school uses the information that is provided by the guardian to set lunch fees, and schools are required by law to provide free lunch to students whom are eligible for the Food and Nutrition Service’s Free Lunch Program. The students that this “alternative” lunch policy affects do not qualify for free lunch and are deemed able to pay, and are expected to pay a certain amount for lunch. On the other hand, various parents have expressed dismay towards school districts for serving “alternative” lunches to students based solely on the action of a parent; and note that this policy wastes food. There is a concern that this policy could potentially position kids that receive an “alternative” lunch to be ridiculed, humiliated, or embarrassed by their peers. 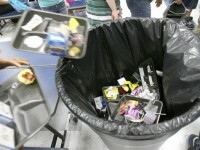 It would be unfortunate for any child to perceive low self-worthiness based on the fact that a school staff member would opt to trash a balanced lunch, rather than provide it to them. There are also students in the United States whom depend on school lunch as their only well-balanced meal each day. This policy is a threat to the certainty of a hot meal for these students. Schools are tasked with being safe zones with adults that are trusted to protect children- even when their own guardians fail to. This policy could blur that ideology for students and guardians alike. Some people cannot stomach the thought of this policy; and nationally it has caused quite a stir. I would love to hear your opinion about it. Also, tell me if you have an experience or story surrounding this policy in the Comments section. Follow PheMOMenal Woman for more blogs like this at: http://phemomenalwoman.wordpress.com/ or www.facebook.com/phemomenalwoman.